Preventive care experts have been divided for years on how to best counsel women on when to get breast cancer screenings. But a new study suggests that women might benefit from individualized approaches to mammograms rather than from universal guidelines. The study, published Thursday in JAMA Oncology, looks at personalized screening protocols tailored to each woman’s risk of developing breast cancer. The study showed that not offering mammograms to women at low risk for breast cancer might reduce the harms associated with screening, while still maintaining the benefits. And it might even be more cost-effective. Mammograms, the gold standard for breast cancer detection, come with the risk of false-positive results — that is, incorrectly identifying a cancer that isn’t really there. Or they might overdiagnose — lighting up for lumps and bumps that may never have become cancerous. That means some women undergo biopsies, surgery, chemotherapy, or radiation they may never have needed in the first place. While the harms are real, so are the benefits: Early detection can save lives. Organizations like the U.S. Preventive Services Task Force and the American Cancer Society choose their ideal benefit-to-harm ratio when issuing guidelines. Since 2009, the U.S. Preventive Services Task Force — an independent panel of experts in disease prevention — has recommended that women get mammograms every two years beginning at age 50. The American Cancer Society recommends that women have annual mammograms from the age of 45 to 54, and then switch over to an every-two-year schedule. The two guidelines — both from trusted sources — reflect a difference in how the two organizations weigh the benefits and harms associated with screening. But the new study proposes a screening strategy that considers each woman’s individual risk. 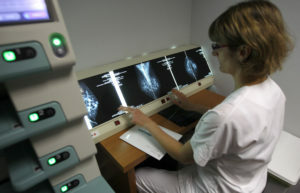 The team, led by Dr. Nora Pashayan, a physician and public health researcher at the University College London, compared three interventions: no screening, age-based screening, and risk-stratified screening based on each woman’s genetic profile and her estimated susceptibility to developing breast cancer. They tested 100 definitions for low risk that determined when they decided not to screen their hypothetical patients. The theoretical patients below that threshold weren’t screened, and patients at or above it were screened according to U.K. guidelines. As fewer women were screened, both the number of overdiagnosed breast cancer decreased, as did the number of breast cancer deaths prevented by screening. Pashayan and her colleagues determined that to maximize the benefit-to-harm ratio, the 30 percent of women at the lowest risk do not need mammograms. The researchers also looked at cost-effectiveness on a population level to determine the financial impact of screening and overdiagnosing patients. They found a plateau where costs continued to rise, but the benefits leveled off. “If you go purely by cost-effectiveness, you would only screen the very high risk group,” or the top 30 percent, Pashayan said. Dr. Lydia Pace, the director of the Women’s Health Policy and Advocacy Program at Brigham and Women’s Hospital, said she approaches screening by examining the potential benefits and harms for each patient, like the study suggests. “I think that’s how most clinicians and most patients want to be making the decision,” Pace said. Part of that process is considering a patient’s preferences. Pace weighs a patient’s genetic profile, but also her personal fears and willingness to accept risk, when making a screening decision. Because the study is based on a hypothetical model of data in the U.K., the findings might not translate directly to the U.S. population. But that doesn’t mean its findings aren’t relevant to the U.S., Pace said. And it could reflect where screening protocols are headed: toward personalized care. This article is reproduced with permission from STAT. It was first published on July 5, 2018. Find the original story here.